Another gorgeous weekend and I have digged the last 5 pounds of potatoes and planted green manure in most empty beds. And had to water seedlings, curiously enough after this summer's weather. Unlike the corn, tomatoes in the greenhouse are almost ripe, I have cooked a second torta pasqualina for ourselves and the neighbours, and put dried herbs in jars, which - with a bit of decoration - will make nice Christmas presents. I am back to work and with the shorter days I cannot be at the allotment during the week... to compensate for the "loss" and at the same time to celebrate my being back on the payroll, I have invested a little bit in memberships to Gardening Organic and the Heritage Seed Library. 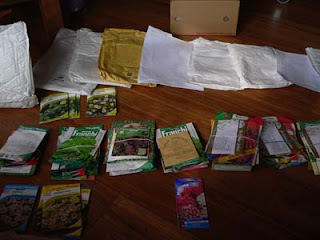 A bit like open-source software, some varieties of seeds can only survive if geeks - enthusiasts - provide some TLC. Otherwise - not having made it through the market screening - they are destined to die out, and their biodiverse genes do not get a future chance. And if I ever have any questions on how to grow the natural way, Garden Organic provides an advice service, in addition to the available information resources (last week I linked their comprehensive information on weeds). If I make it through the next couple of business-busy weeks, I will read through the material they sent with the subscription, including how to compost with worms. Spinach beet and torta pasqualina. 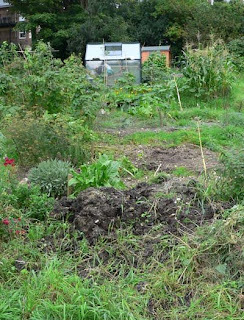 After breaking your back on the allotment all your spare time, the last thing you would want is to throw away any green stuff. 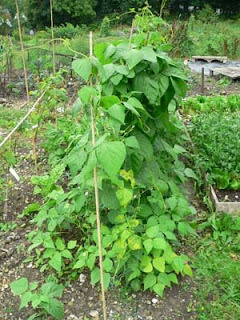 Usually, though, when something is in season you get far too much of it, albeit for a very short period of time, as family and friends of allotment holders surely know. Well, the spinach beet that has grown from self-seeding is doing very well, so that I cannot keep up with it (why do slugs not exterminate it as they do with the rest, I wonder?). Anyway, each time I do a round of leaves I come home with some two pounds (they are so big I can hardly carry them home on my bike!) so now I have to figure out ways of using them that are not too boring (not another two pounds of boiled beet, no!!!). So I have at times resorted to the Pizzoccheri della Valtellina recipe, a very hearty meal that I cook with cabbage, chard/beet, potatoes AND French beans... always one of my favourites and you almost get your 5-a-day with it! However I have run out of pizzoccheri and forgot to have some sent from Italy, so I thought of the next best recipe I know: torta pasqualina. 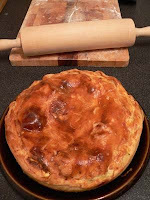 I had never actually made one myself before, and I had not been cooking anything serious (apart from pizza) since we came to the UK more than three years ago - for personal reasons of incompatibility with the oven, more than anything else, really! But, you see, that's what your allottment makes you do! I decided to have a go, resuscitated my tools and... it was easier than expected and the result outstanding! Proof of the pudding: the two of us got rid of it in just two meals! If you read Italian, this is the recipe I loosely followed. Amazing weather these last three days, it was a pleasure to be outside and I took advantage of it to finish digging my last but one bed, and to plant spinach, some more cime, turnips, salad and barbe di frate. Hopefully tomorrow there will be a good shower and then sun again. Talking of solanacee, I have experimented with plastic bells to cover the chillies, afraid that it might be too cold for them at night. I have a feeling that the stagnating air inside the bells might not be too healthy, but will check them in the next couple of days and see. French beans still doing well, with another 500gr picked, and the Borlotti beans are on their way. However, I have made a mistake fixing the labels in the ground which - together with my wobbly staking - makes it impossible to tell which plant is which (apart from the Borlotti that stand out quite conspicuously with their red and green pods). Pumpkins also growing, but the sweetcorn's inspection was a little bit of a disappointment: cobs do not seem ripe yet in spite of the tassels at the top turning brown a while ago (I would say one month in some cases). I have finished transplanting all the strawberry's runners that I had kept in water to root, and it felt like an achievement. From the initial 12 plants, I have filled a bed and started a second one: if they live, next year there should be a good supply. It seems that Honeoye has been putting out runners for some three months and Alice has started one month or so ago, but Florence has none, maybe because it was the best cropper and all its energies were spent fruiting. Good news, there are also two tiny aubergines emerging from the spent flowers' crowns. 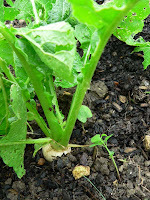 Wildlife pond, slugs, crop updates, self-sufficiency and stocktaking. I have finished working on the pond: now it has a toad cavern, a sunbathing platform for frogs, and waterplants in it. For the rest, nothing very exciting: the herb bed needed weeding before I cover it up for the winter - it seems it won't be long before night temperatures plummet. News from the animal kingdom: all cabbage white caterpillars either pupating or drowned, the slugs are taking over as insect of the month. I have been killing them in dozens, and I was also "lucky" to uncover a handful of eggs under a stone, which I squashed one by one with manic patience. Small slugs I cut in two with scissors because they have this habit of propelling themselves away when I try my favoured method: jumping on (disgusting as it might be, I favour the method as they die straight away, without apparent suffering). Thinking of it better, though, there is something quite exciting: this week for the first time I have been as self-sufficient with my vegetable supply as I will ever be this year. Potatoes, onions, shallots and garlic already harvested and stored, courgettes and flowers picked almost every day, French beans, perpetual spinach (a bonus, as it grew from self-seeding rather than me planting it! 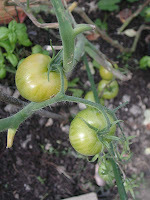 ), green tomatoes, salad, basil, mint, sage, oregano, fennel, parsley. In case of emergency, I even have some frozen broad beans left. And - shortly - Florence fennel, sweetcorn and leek will be ready. a space ready for planting (now I am a bit stuck as I could plant things but the beds are not ready yet). So, yesterday, I started my "professional" stock-taking. I have a spreadsheed where I am trying to keep track of expenses, yield, stock of seeds and plants. Quite a sizeable stock (179 species for next year, to be precise - I am a collector by character, no doubt of that!). Which stock, taking advantage of a cooler, gray day, I have catalogued and sorted by month of planting. During the winter, I will need to assess the family of belonging of the plants, and find a suitable place for them in my 4-year crop rotation. I think the most difficult thing will be keeping in mind all the relative lifespans of the plants so as to introduce catch crops and plan timely succession. I do not know if I will manage to be that precise anyway, though, gardening is after all my hobby , I should allow myself to leave some spontaneous enjoyment in it! 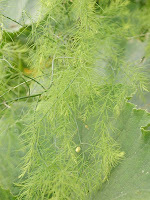 Male or female asparagus, slugs, wildlife pond, crop updates. I was all set on pulling the female asparagus plants today: my plan was to create a separate bed only for them. However, when I got there no sign of either berries or yellow flowers (that yellowy thing in the picture should be one). Now I am not sure which plants I have to pull, so I suspect I'll leave it for this year. It must have been birds, as slugs would leave traces on the plants as well, but there was none. Talking of slugs, they are really the major pest in my allotment and I will have to come up with some serious plan for next year - the cime have all gone, most of the new round of turnip's seedlings disappeared, the salad patch is a wasteland and several of my potatoes have been tunnelled into by as many as 10 slimy creatures together. Today I have bought collars woven with copper fibres and I think I will have to resort to nematodes as beer traps have not worked: more ground beetles than slugs drowned, which is no good as ground beetles feed on slugs and knocking them off is not a good move. I have planted Marsh Marigold and Purple Loosestrife in and around the pond respectively, and had a go at creating a toad cavern with flint and a spare tile I found abandoned around, let's see if it stands the weather this winter. As soon as the pond gets clear again of the mud I have stirred today I will create an island for the frogs to sunbathe on, by placing bricks on the bottom of the pond and a concrete slab on top, as suggested by VeggieGlobal. 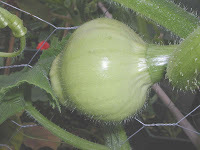 The pumpkins are growing quickly and so are the French beans. The transplanted Florence fennel is putting out new feathery fronds, which I decide to interpret as a good sign, hoping that the bulb will follow after the leaves. I managed to pick one ripe tomato Tigerella from the greenhouse, while a handful I had to throw because they were diseased. Finger crossed for the rest. And the only surviving chili plant has one single flower on. I am wondering whether I should cover it now before it gets too cold. After all the hassle to grow chilies, I hope this "Hot Mexican" is a perennial species, I may still find the seed packet and be able to check. Autumnal mood, wildlife pond and gardening, wind and staking. My visits to the allotments in the last couple of grayish days have thrown me in a blue mood: the lush green - both vegetable and weeds - is receding, bed by bed, and quite surprisingly it is affecting me! I do not know why, it's not that there are fewer interesting things, or less to do. And talking of interesting things, the pond has surprised me. As the rose bushes and the wildflower lawn are less thick, and the water is quite clear, I could observe the new life that has developed over the year: there are plenty of water boatmen of all sizes - which worried me a little because some eat tadpoles, but then I was reassured - and several other tiny swimming and wiggling thingies that I could not identify (despite this pretty clear table). I was surprised by such a lively swarm of insects, maybe the two ducks that came for a while in early summer helped somehow. Even if they didn't, they were an amusing view, standing on their legs in the shallow water! The strong wind these days has put to serious test my staking skills, so I had to fix the beans, adding more bamboo sticks to carry the weight. Luckily I had bought some over the weekend. As autumn's is definitely marching on, I have finally decided to place the hedgehog hideaway. I am a bit worried that this might attract rats instead, they would never say on the instructions, would they? The last thing I would wish is to help shelter those beautifully furred but nasty creatures. - the pupa of my 'insect of the month': the cabbage white butterfly. This is the first time I have seen one.